Dan Giusti left his job as head chef at one of the world’s top-ranked restaurants to volunteer for one of the most unglamorous cooking jobs in America. This summer he will start managing chefs in schools, and he couldn’t be prouder. Ambitious cooks coming out of culinary school all want to work in fine dining, said Giusti, explaining how he ended up at Noma, in Copenhagen, Denmark, ranked best in the world four times by Restaurant magazine. I wanted to wake up every day and think I am doing something that is affecting people’s daily lives. Can Technology Help Workers Eat Healthier? “I wanted to wake up every day and think I am doing something that is affecting people’s daily lives. That is important to me,” Giusti added. Giusti, a 31-year-old New Jersey native with Italian roots, speaks fast, with a voice rich with urgency, energy, and passion. He said his first thought was to try doing affordable fast food, but he couldn’t work out a price point low enough. He then started to consider institutional food, like at hospitals, prisons, and schools. These places all have kitchens and people working in them, he said, but they may not be working efficiently. The idea of school lunches really intrigued him. The National School Lunch Program serves lunches to more than 31 million children each day, according to the U.S. Department of Agriculture (USDA). “The more I thought about it, the more I loved it,” said Giusti. He reasoned that a chef’s natural ability to manage a million things at once (both on the stove and off) would be just the right skill set to elevate what is reputably an uninspiring experience for most students. 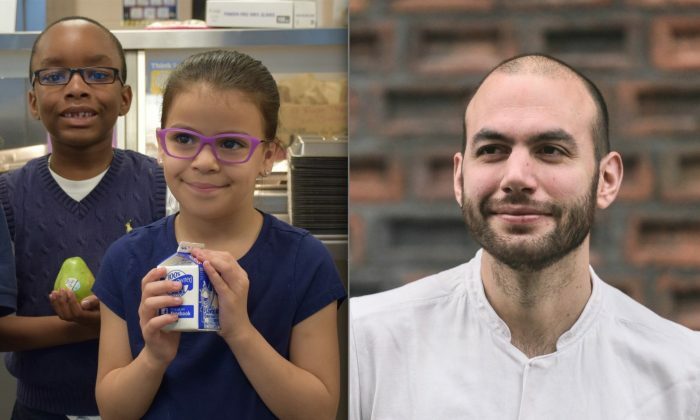 It so happened that he was talking about his idea one day at Noma, when the step daughter of the superintendent of schools for New London, Connecticut, overheard Giusti’s idea of chefs in schools. When Dr. Manuel J. Rivera learned about Giusti from his step daughter, he reached out without hesitation. After a series of email exchanges, time passed, and Rivera said he next learned from the newspaper that Giusti had returned to the United States to pursue his dream. Rivera immediately invited Giusti for a visit. A partnership with the internationally renowned chef fit perfectly into Rivera’s far-reaching plan to raise standards across the board for his students. Of the 3,300 students in the New London district, 90 percent qualify for free and reduced-cost lunch, which means a family of four must earn no more than $43,568 per year, according to the USDA. About half of the children in the district come from broken homes, said Rivera, and obesity and hunger are big challenges. After traveling extensively to visit schools and considering his options, Giusti ended up choosing New London’s six schools to pilot his ideas, and earned all the necessary approvals with Rivera’s support. Giusti hopes to attract great chefs who believe that institutional cooking can be cool. Plans for the Chefs in Schools program at New London go far beyond the procurement and service of healthy food. “We are putting chefs into schools to really put thought into everything that goes into food service,” said Giusti. In the United States, most free school lunches are reimbursed by the federal government at $3.07 per meal. There are also reimbursements for breakfast, snacks, and suppers, as well as additional donated surplus food available through the USDA and Department of Defense (DoD). The reimbursed amount must pay for everything: ingredients, labor, equipment, maintenance, and sometimes even rent and utilities for the kitchen and cafeteria spaces. Giusti’s company, Brigaid, will cost more than what New London schools currently receive from the federal subsidies. On top of the existing kitchen structure, which consists of a district school food director, and school-level kitchen managers and staff, each Brigaid chef will be paid $60,000 per year, and the company will get an additional $120,000 per year as an operations fee. New hires will need to be personable, patient, ready to teach, nimble, dynamic, and flexible enough to cook with a bare minimum of equipment at a very low cost point. Rivera said he is fundraising to pay for the upfront costs, but the plan is to have a self-sustaining model by the end of year three. Giusti said new revenues will come from greater labor efficiencies (current kitchen staff are organized to do more), an increase in the number of meals served, as well as new revenue streams from expanded use of the commercial kitchen facilities, which will include evening cafeteria hours, and in year two the possibility of affordable dinner meal kits for families. Giusti said he received 300 applications from chefs for the new job. He hired in May for an August start. New hires will need to be personable, patient, ready to teach, nimble, dynamic, and flexible enough to cook with a bare minimum of equipment at a very low cost point, said Giusti. His hope is to attract great chefs who believe that institutional cooking can be cool. Giusti said they will learn together, build an arsenal of tools, and then spread out across the country to replicate the model. Giusti’s newly trained chefs could be in high demand. According to a Harvard policy brief, 64 percent of schools reported they needed to train staff to meet new school nutrition and quality standards outlined in the 2016 Child Nutrition Reauthorization Act. For example, a school lunch is required to provide one-third of students’ daily calorie, protein, calcium, iron, vitamin A, and vitamin C needs. Giusti emphasizes that he is not planning major changes right away. To illustrate the kind of change he envisions to start, he talked about one particular meal he saw at a school. It consisted of a yogurt parfait, a mozzarella stick, a packaged corn muffin, an apple, and milk. The typical school fare of pizza, burgers, and fries does not even begin to represent how most students eat at home. The only thing “cooked” by the staff was the parfait. It was actually assembled. And the corn muffin, which had been previously frozen, was wet from condensation. Giusti thought, why not take the muffin out of the bag and warm it in the oven, so it is no longer soggy, and it smells like a muffin? He said school cafeterias don’t even smell like food these days. Giusti isn’t blaming anyone for today’s state of affairs. He said the schools are not equipped to do anything differently. People are not paid enough, he said, and many kitchen workers are part-time. It takes skill and a lot of time to create a recipe that meets federal and state nutrition requirements, document it, source the ingredients, cook it, and serve it, he said. Most school food workers don’t have the time or training to create and document a recipe, said Giusti, so it is usually easier for them to procure from large suppliers who can assure buyers the products meet federal nutrition rules. This explains how most of the food served in schools came to be processed, said Giusti. Giusti said Brigaid’s work could lead to new supply chains, such as from more local farms and manufacturers. He said Brigaid would be open to trying new things. Fortunately for Giusti’s team, New London just won an award for running an exemplary farm-to-school program using federal grant funding. According to Samantha Wilson, the district’s child nutrition program manager, speaking in a press release, the school worked with more than a dozen farms and organizations for the 2014–2015 school year. Another idea is to potentially incorporate ethnic foods into the menus. The typical school fare of pizza, burgers, and fries does not even begin to represent how most students eat at home, according to Giusti. Giusti’s passion for this work came first from his family, from one aunt in particular, who was always willing to cook and take care of the family. His next inspiration came from René Redzepi, his boss at Noma. Giusti said Redzepi was always looking to make things better, and considered nothing impossible. “On a daily basis, we were pushing people to do things they didn’t think they could do themselves,” he said. Giusti’s hope is that one day soon there will be massive changes in how America approaches school food, but he cautions that change will come in baby steps. He hopes that in five years’ time, Brigaid will be operating in a number of school districts across the country, and its chefs will help to advocate for policy changes. He would love to see more flexibility in the guidelines for school food. He would also like to ensure that new schools are required to build kitchens, as many schools are now being built without them, or their kitchens are neglected. Civil Eats estimates school infrastructure needs nationwide at $5 billion, according to state-by-state data published by the Pew Charitable Trusts. At some point, a substantial food education curriculum taught in all schools “would really be a true sign that food is being taken seriously,” said Giusti. The science linking sugar to health is very new.